Some things will never change. Some things will always be the same. Lean down your ear upon the earth and listen…..All things belonging to the earth will never change–the leaf, the blade, the flower, the wind that cries and sleeps and wakes again, the trees whose stiff arms clash and tremble in the dark, and the dust of lovers long since buried in the earth–all things proceeding from the earth to seasons, all things that lapse and change and come again upon the earth–these things will always be the same, for they come up from the earth that never changes, they go back into the earth that lasts forever. Only the earth endures, but it endures forever – Thomas Wolfe, in You Can’t Go Home Again (1940). There are numerous influences in my childhood that propelled me to a career in the Earth sciences; a father that loved to prospect and collect minerals, hundreds of family camping trips to the most interesting geologic province in the world (the Rocky Mountains! ), and a progressive high school that offered a rich course in geology. In hindsight, one of the most important influences was the fact that I grew up on the flank of a huge volcanic complex, the Jemez Mountain Volcanic Field. The terrain of deep canyons, flat mesas, and a beautiful grass valley, the Valle Grande, surrounded by ponderosa pine covered peaks frame my childhood memories and help define home for me. The Jemez Mountains rise some 5000′ above the Rio Grande River and are remnants of a massive volcanic system that experienced two “super” eruptions about 1.4 million years ago. The Jemez don’t really look like a volcano today if one’s idea of an active volcano is Mt. St. Helens or Kilauea – it is a large circular depression surrounded by the high peaks that once where the steep slopes of a series of craters that spewed forth hundreds of cubic km of hot ash. The figure at the top of this column is an aerial view of the Jemez, and the depression and surrounding peaks protect a series of valleys that once were filled with rain water after the great eruptions. These valleys, or valles in spanish, are a unique feature of the Jemez. These mountains shaped me in many ways. Out my back door was a riveting geologic panorama that provided an open invitation to explore nature. Although most of the Valle Grande proper was off limits during my youth – it was a working cattle ranch that we just called “The Baca” in recognition that it was part of a old Land Grant called Baca Location Number 1 – the surrounding mountains and forest lands were our play ground. View from within the Valle Grande to the west. The high peak is Redondo Peak, and the smaller rise on the righthand shoulder is Redondito Peak. The Valles Caldera marathon traverses around the base on Redondo on the edge of the Valles. I learned about hiking, camping, wildlife, and calm call of nature. I even learned some things about mineral collecting; in general, there is not much “mineral wise” in the Jemez, with the one exception. My first vehicle was a hand-me-down four wheel drive Toyota Land Cruiser. Not many things worked on it (including the gas gauge which more than once left me stranded), but it did afforded me the freedom to explore the Jemez on my own. My favorite trip was to the ghost town of Bland, a short-lived gold mining center located a few miles south of the Valles Caldera. The mineral deposits were not formed by the volcanic processes that built the Jemez Mountains, but were from an earlier epoch of magmatic activity that injected quartz dikes into surrounding bedrock. The Jemez volcanics covered these dikes, and later, through the randomness of erosion, were exposed in a narrow canyon (Bland Canyon). In 1893 the first of a dozen claims was staked on these dikes for gold and silver. A rush ensued, and soon a town was built and the population grew to more than a 1000 people. The town was named Bland in honor of Richard Bland who had advocated for the governmental purchase of silver, and in turn, that bullion was minted into silver dollars. The Bland act, and further requirements for the government to purchase silver (in particular, the Sherman Silver Purchase Act) were repealed in 1893 causing a collapse in silver prices — just as the mines in Bland were being discovered. 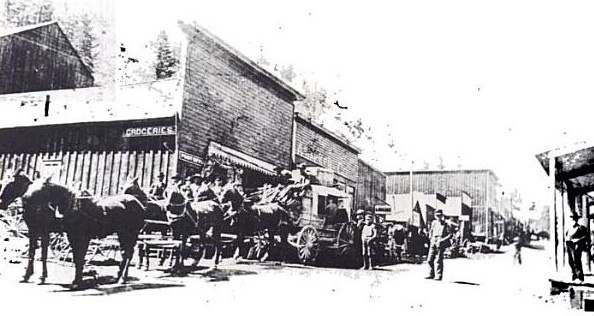 The boom town of Bland, circa 1900. Many of these same building were identifiable in the early 1970s when I searched for artifacts (with some success) and traces of gold or silver (without any success!). Unfortunately, all traces of Bland were destroyed in the 2011 Las Conchas fire – it is even impossible to find most of the old mine dumps. I drove to the ghost town of Bland every chance I got in the early 1970s. 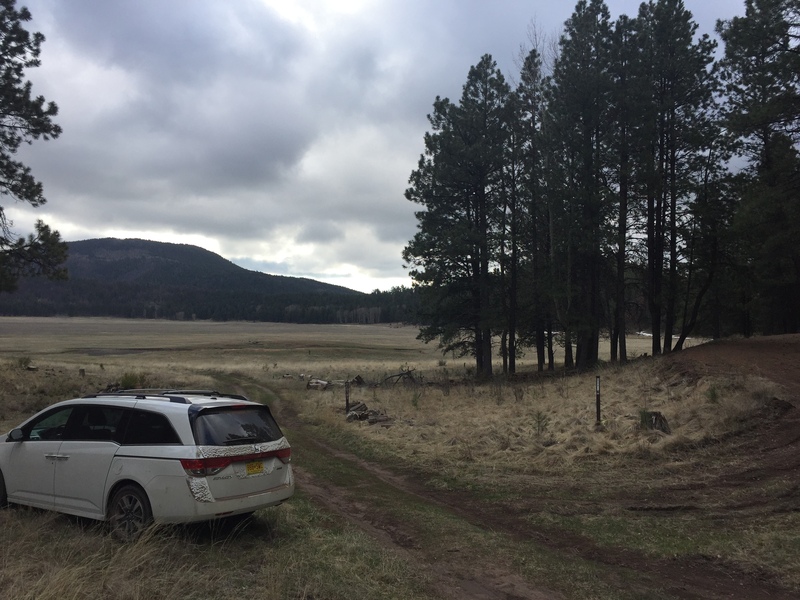 There was a “back way” in that required delicate 4WD navigation; I was rewarded with a harrowing journey through the Jemez Mountains, and a chance to search through all the old building looking for artifacts and the mining dumps for some sign of gold or silver. Mostly my searches were unsuccessful, but I had taste of the treasure hunter. An insulator I collected near Bland in the early 1970s. 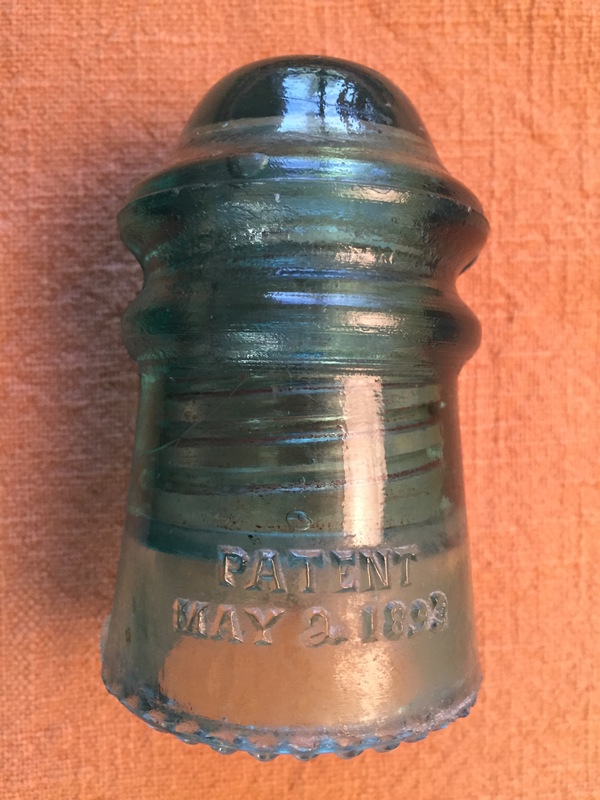 The screw on glass has a patent date of 1893. In the year 2000 the Federal Government purchased the “Baca” and it became the Valles Caldera Natural Preserve. The charge of the Preserve was to remediate the effects of logging and cattle/sheep grazing, and eventually make the Valles Caldera a multi-use facility. Although access is still carefully controlled to the Valles it has become the home to several special events. In 2006 it became the site of a trail run – first a marathon, and later a half marathon and 10 km run were added. The course has changed over the years, and a fire in late May of 2013 forced a change to a partial out-and-back route. 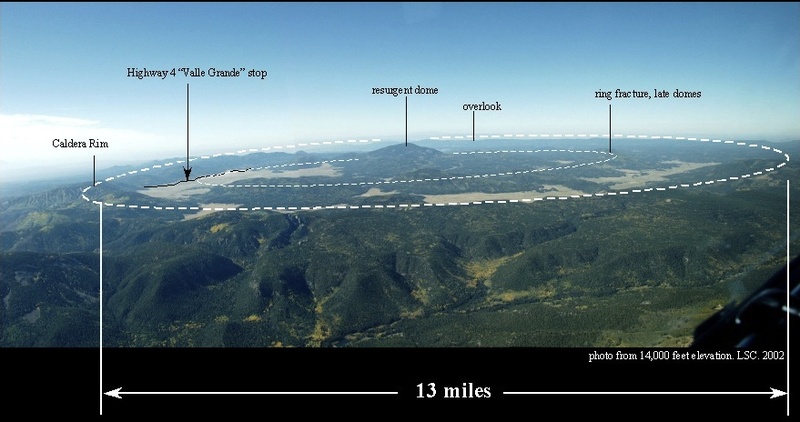 The chance to run in a certified super volcano, only a few miles from my house is a huge draw – the Valles Grande Caldera Runs are a geologist’s dream. A recent NASA satellite image of the Valles and Jemez Mountains (click on the map to get a large, and clearer view). The circular depression of the caldera is obvious; left of the depression (east of the caldera) is Los Alamos. The brown-gray color is due to the denudation of the ponderosa pine and other vegetation after the 2000 Cerro Grande and 2011 Las Conches fires. The Jemez Mountains and Valles Caldera are a spectacular sight from space. The satellite image above shows the circular depression that is about 13 miles across that formed after a series of very large eruptions of ash-flow tuffs emptied a large, shallow magma chamber. Nearly 800 cubic km of ash were propelled from various volcanic vents, and the “hole” left by this erupting ash caused the volcanic edifice to collapsed back into itself producing a broad valley. Later, renewed magmatic activity pushed rhyolitic magmas up through the fractures formed during the collapse, producing a ring of domes breaking up the original valley into smaller, isolated valleys. The largest of these magma extrusions, known as resurgent domes, is Redondo Peak, which has an elevation of 11,258′ and towers some 2500′ above the valley floor. Redondo Peak is not a volcano – it was not “erupted” but extruded from the magma chamber beneath the Valles much like tooth paste would be extruded from a tube as it is slowly squeezed. 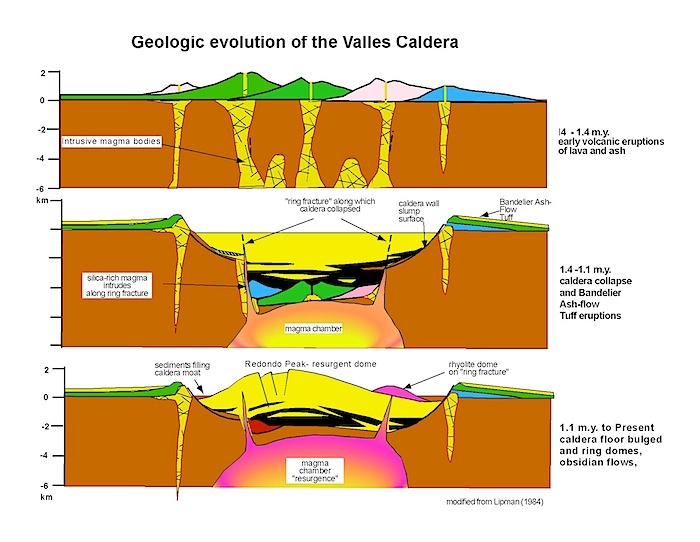 Geologic evolution of the Valles Caldera. The Valles volcanic center was active for 12 to 13 million years before a pair of major eruptions (1.5 and 1.2 million years before the present) caused the edifice of the volcanic system to collapse forming a large circular depression. 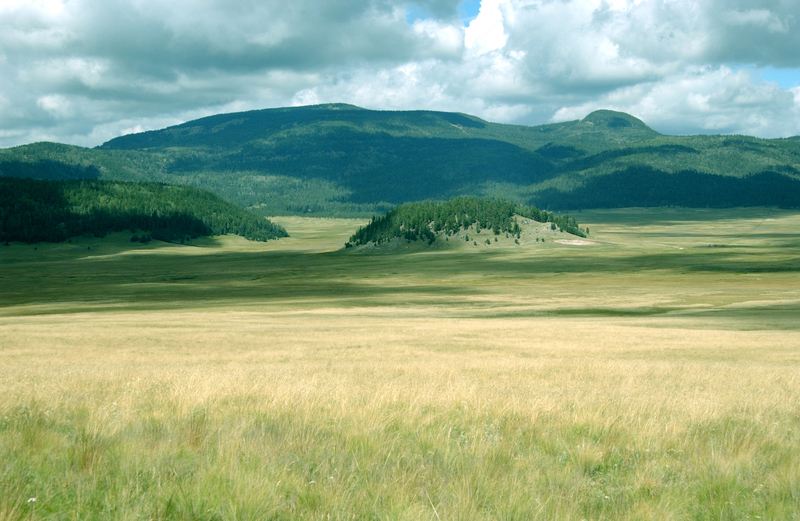 Eventually this depression was dotted with a number of volcanic plugs or domes, forming the mottled landscape of Valles Caldera today (Image from the New Mexico Museum of Natural History). The Valles Caldera remarkable symmetric, and incredibly well preserved — there were no major eruptions after the last collapse a million years ago to obscure the valley, resurgent domes and ring fractures that were formed during that collapse. These qualities attracted geologists from around the world, and it has become the archetype volcanic caldera referenced in hundreds of studies and textbooks. Although the Jemez Mountains were recognize being volcanic by the later part of the 19th century, it was not until the 1920s when C.S. Ross of the USGS visited, and later teamed with R.L. Smith in 1946 that the area was mapped in detail. This mapping was done in part to understand the potential for supplying the new Los Alamos Scientific Laboratory with fresh water, and whether it was possible to bring a large natural gas line across the Valles to provide energy for my home town. In 1970 Smith, Bailey and Ross published a beautiful geologic map of the Jemez Mountains and the Valles Caldera (figure below), and was the first map to grace the wall of my bedroom (I wish I could find that original wall hanging, but alas, it was packed away when I left for college and no doubt is today been composted and returned to the soil…). 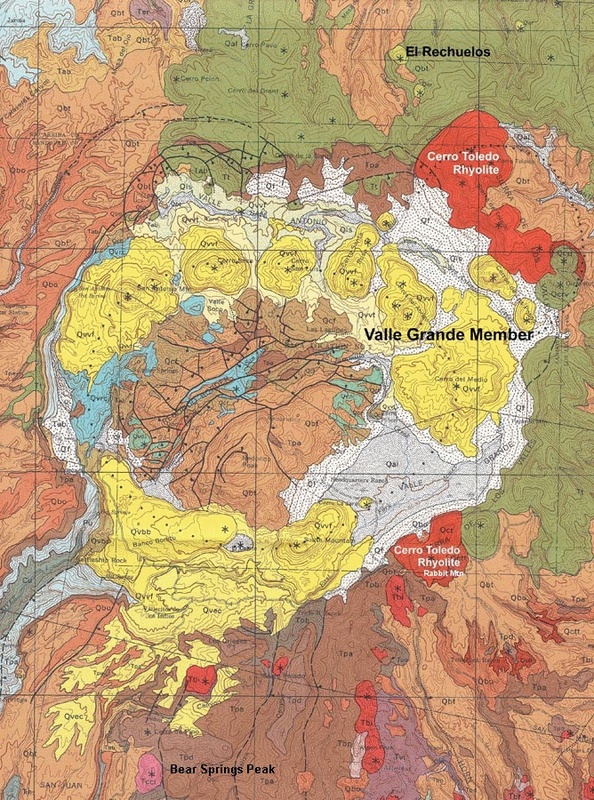 A section of the Smith, Bailey and Ross map (1970) showing the geology of the Valles Caldera. The yellow domes circling Redondo Peak (the brown color in the center of the figure) are the post collapse rhyolite resurgent domes. The olive green color is the Bandelier Tuff – the base rock beneath Los Alamos. The colors of the map hint at the extraordinary history of the Jemez Mountain Volcanic Field (JMVF). The exact reason that the JMVF exists remains a bit of a mystery; it is located at the intersection of the western margin of the Rio Grande Rift and a trend of volcanic fields called the Jemez Lineament that has been postulated as a ancient “zone of weakness” that allows magma generated in the mantle to rise up into the crust. 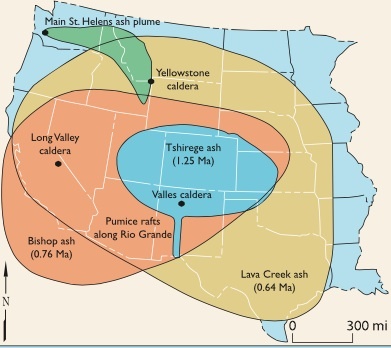 I think that it is far more likely that the Jemez Lineament is the lucky connection of dots on a map, and that a more plausible explanation is that marks the boundary between a thick and stable crust (the Colorado Plateau) and thinner, more tectonically active crust. Irregardless, it is clear that the opening of the Rio Grande rift caused volcanic activity to began about 13 million years ago in the vicinity of present day Los Alamos. For about 10 million years the volcanism was dominated by basaltic lava flows. Black Mesa, near Espanola, is one of the most famous landmarks representing this period of volcanism (Black Mesa is about 3.7 million years old). About 3 million years ago eruption of more silica rich magmas commenced and the Jemez Mountain began to grow — there were probably 6 to 10 major volcanoes that tapped interconnected magma bodies. These volcanoes conspired to create a major eruption about 1.5 million years ago that erupted what is known as the Otowi Member of the Bandelier Tuff. Nearly 450 cubic kilometers of ash was erupted over a short period (probably a few years, but certainly less than a few decades). This resulted in a collapse of the volcanic system, and the creation of the Valle Toledo Caldera. 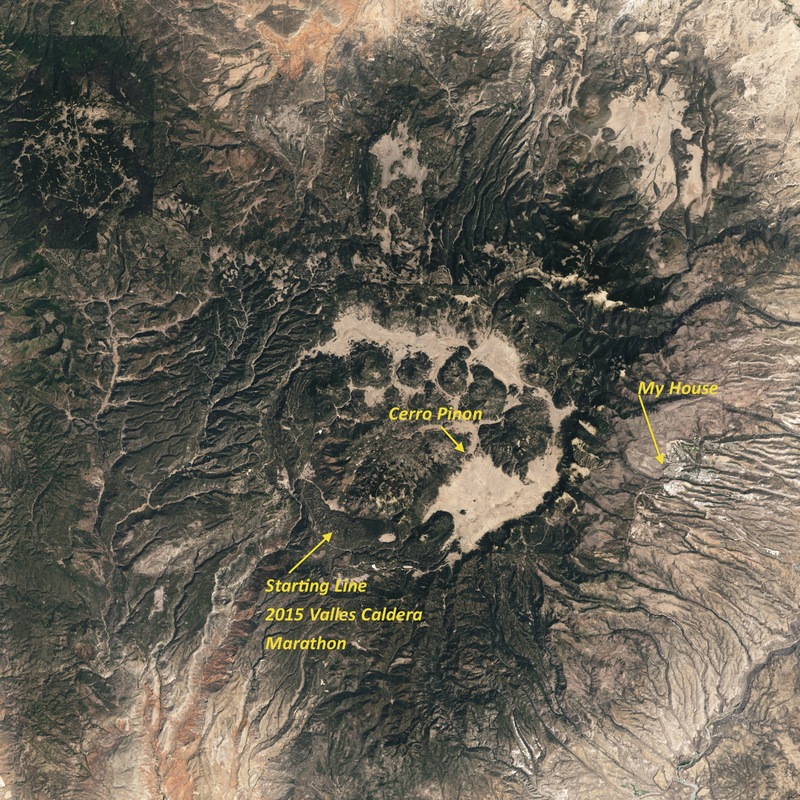 This caldera is obscured by a similar sized eruption about 1.2 million years ago that ejected about 350 cubic kilometers of ash, the Tshirege Member of the Bandelier Tuff. On the eastern margin of the Valle Toledo is the highest peak in the Jemez, Tschicoma Peak (elevation 11,561′), an remnant that survived both collapses. The second eruption, and subsequent collapse created the now familiar Valles Caldera. Extent of ash fall from the second major Jemez Mountains Volcanic field eruption (1.2 million years ago). Ash has been identified in Kansas and Wyoming, and a large volume of the ash was transported down the Rio Grande (the blue streak in the map down the center of New Mexico). The widely popular phrase “super volcano” has its roots in the 20th century, but mostly it is a phrase invented by the media around 2002 to dramatize the power of big volcanoes. By 2003 the phrase appeared in more than 100 stories that covered everything from global warming and cooling to mass extinctions. The USGS tied the phrase to the Volcano Explosivity Index (VEI), a measure of “explosiveness of eruptions”, and a VEI value of 8 became the definition of a super volcano, and implies a volume of material erupted that is at least 250 cubic km. There have been 3 super volcanic eruptions in the US in the last 1.2 million years; the Jemez, Long Valley, California and Yellowstone in Montana/Wyoming. All three of these eruptions resulted in the creation of a caldera. Of course, our human centric view of geologic time — i.e, a million years is a long time — distorts the sense of “super” volcanic eruptions. Although Yellowstone was a large eruption, it was dwarfed by an eruption 28 million years ago that created the La Garita Caldera near Creede, Colorado. Over the same time that it took the Jemez to erupt the Tshirege tuff, the La Garita erupted the Fish Canyon Tuff — all 5,000 cubic km of it (more than 15 times larger!). Despite the size of La Garita, Los Alamos is perched on the shoulder of a real super volcano. 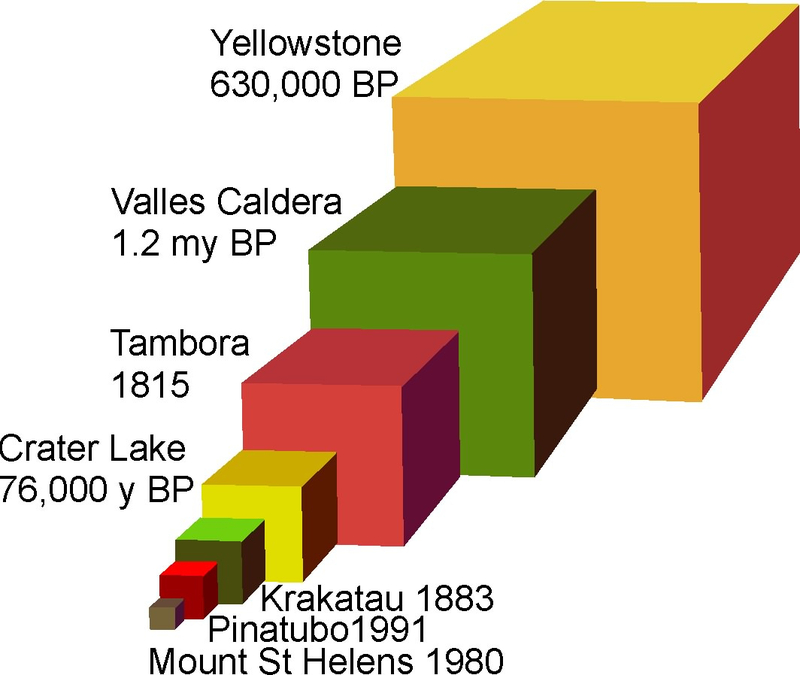 Comparisons of volumes of eruptions – Yellowstone and the Valles are “super volcanoes”, while more recent eruptions like Crater Lake and Krakatau have to settle for being “big” and Mt. St. Helens is just puny. The relative tranquility of the Valles Caldera belies its violent history and magnificent history. The most recent significant volcanic activity in the Jemez is the Banco Bonito rhyolite flow, which is located smack dab in the middle of the Jemez Caldera marathon. The Banco Bonito is a very silica-rich rhyolite, and filled with large blocks of obsidian. Although most everyone recognizes obsidian, and thinks arrowheads and black shiny pebbles, the geologist thinks about very rapid cooling of a volcanic rock. Obsidian is silica glass – same material as a chunk of quartz, but it has no crystalline structure due to the rapid quenching of the hot lava. The Banco Bonito rhyolite was extruded (probably not erupted) 40,000 years ago. Although the Jemez Mountain Volcanic Field will be active again in the future, it is mainly showing signs of exhaustion, and the likelihood of a future, large scale eruption is extremely small. Running through the Valles Caldera on a marathon is a unique experience. Laid out along the course is every aspect of a few million years of violent tectonic history. Ash fall, resurgent domes, ancient lake beds that filled with water in cooler and wetter times. A view from the southeast to the northwest across the Valle Grande, Redondo Peak, the the Colorado Plateau on the horizon. A little over 1/2 of the marathon course is an out-and-back from El Cajete to Cerro Pinon – right through the heart of the Valles Caldera. Also shown is the head of Bland Canyon, home of the ghost town. Picture from 2011 Nature article on Southwest drought. The Valles Caldera runs – there is a marathon, half marathon, and a 10 km – are not classic trail runs per se. Most of the courses utilize dirt roads that once were used to move cattle or cut timber, and only some short segments are single track. However, this does not diminish the spectacular setting of the race. It does mean that most people run the distances much faster than a typical trail run (I say “most” because single track versus tire rutted roads has nearly zero impact on my speed – sadly). 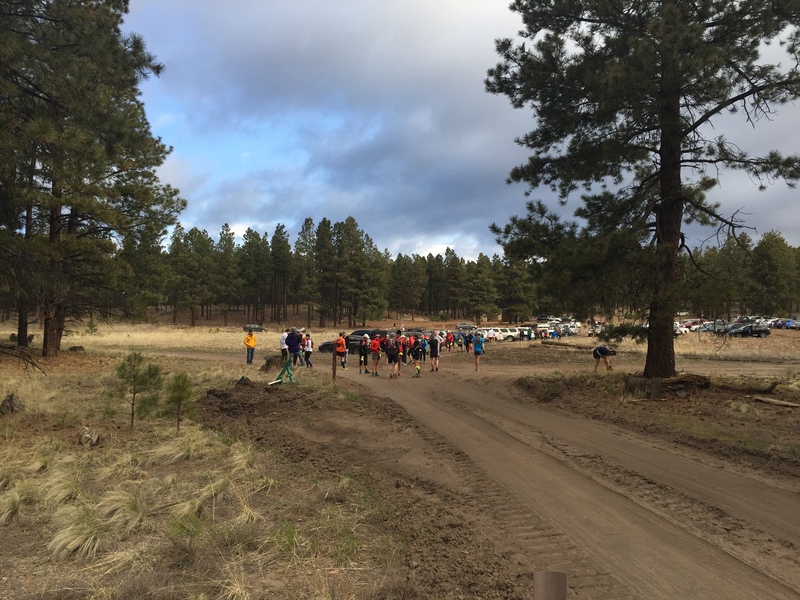 The races start at Banco Bonito Staging Area within Valles Caldera National Preserve. The name “Banco Bonito” is applied to a modest plateau that is composed of the rhyolite-obsidian conglomerate that goes by the same name. It is easy to find very attractive pieces of obsidian at the starting line — just look down. There are more than 300 people signed up for the half marathon and 10k, but only about 45 of us toe the line for the full marathon at 7:30 in the morning. Gathering of the runners for the start of the Valles Caldera marathon. Temperature at the start was 34 degrees, and throughout the day the weather alternated between sun, clouds and occasional grapple. Perfect. The course for the marathon heads due east, climbing up the Banco Bonito lava flow along a logging road. The lava flow is probably not obvious to most of the runners as it now is forested, and only along certain sections are there stratigraphic sections exposed. But the topography of the lava flow is evident; over the first three miles we climb about 450 feet (not much elevation gain, but enough to slow old runners down). The pack of runners sorts out pretty rapidly, and good runners like Dave Coblentz disappear with a doppler shift over the horizon. At the three mile mark the course comes to an aid station on the edge of a large bowl shaped depression — El Cajete. This is a very significant geologic formation (but not such a significant aid station). El Cajete is the crater that last had significant volcanic activity in the Valles Caldera. It is responsible for the Banco Bonito lava flow 40,000 years ago, as well as a massive eruption of pumice sometime after the lava flow. The pumice fell close to the El Cajete, and dammed the Jemez river creating a lake in the Valle Grande. Aid station at mile 3 – looking out on El Cajete. If you click to enlarge the photo you can see a herd of elk scurrying across the crater on the right hand side — the crater is big, so the elk look small. From El Cajete the course drops off the plateau and the run is downhill for 2 miles. Fast and easy. Unfortunately, the elevation lost is a penalty for the next part of the race. At mile five there is a steep climb up a pass between Redondo Peak and another resurgent dome called South Mountain. In a little bit more than a mile we climb 550 feet to the high point of the race, 9150′. The top of the pass is a reward, but also a harbinger of things to come since we have to repeat this climb on the return from the Valle Grande. Course elevation profile. By my watch the course of 25.8 miles long. From mile 6 to mile 12 the course is in the Valle Grande – well, strictly speaking, skirting around the edge of the Valle. The grass “meadow” of the Valle Grande is due to the fact that it was a reoccurring lake bed in the last million years, and it is not particularly friendly nutrition wise to trees. The last time the lake had a significant extent was after the El Cajete pumice eruption, and probably lasted for 4 to 7 thousand years (there have been smaller lakes during damp cool periods usually associated with glacial epochs). The picture below is a view across the Valle towards Pajarito Mountain. That summit, all 10,400 feet of it, is the high point of the Jemez Mountain Trail Runs — which will be run a month from now. A view across the Valle Grande to Pajarito Mountain. The weather alternated between sun and dark clouds through the entire run. The temperature was mostly in the high 40s, perfect for running a marathon. Running through the Valle is always wonderful. It is sensational scenery, and mostly flat topography. At mile 9.4 I get passed by the leader of the pack returning towards the finish. This means that the leader is about 4 miles ahead of me already. Once the first runner passes by me it is a steady stream; strangely, all the runners that are ahead of me look like they are strong and running very easily. I, on the other hand, am beginning to lose focus and daydreaming of the geology. Dave Coblentz passes me with a group of 5 or 6 runners at mile 9.7. 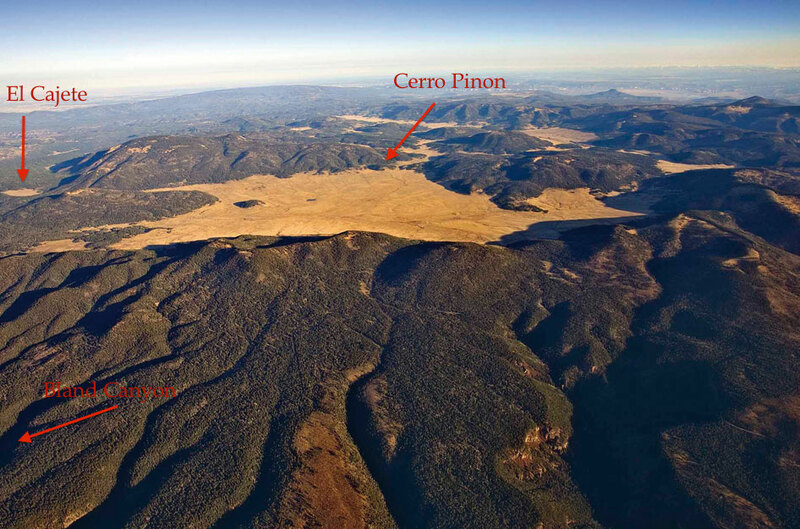 The course “turns around” is at a point just beyond another resurgent dome — Cerro Pinon. The milage here is just about 12 miles; there is a mental boost knowing that the “out and back” is done, but I also realize that there are 14 miles to go. For the next 5 miles I pass by a few runners (a very few) that are slower than me, but mostly see no one. I am alone – happy, but alone. The climb back up the pass at South Mountain is brutal, but once that is done I am certain that I will finish the race largely unscathed. The run down from South Mountain is fast, but as I expected, hard on my legs. The run between miles 18 and 22 is a descent of nearly 800 feet. It should be fast, but my legs are tired. There is a great aid station at mile 19, and I stop for way too long to eat oreo cookies. The descent ends at a broad meadow called Redondo Meadow. This meadow is an wildlife experiential station, and there are lots of people working in the area. The course route is always confusing here because there is no real trail across the meadow, and there are meandering streams. The course is marked, but that means you actually have to pay attention to the flagging (not my best skill – however, I have memorized the maps, so I don’t get detoured). Once across the meadow the home stretch begins. A steep climb up the Banco Bonito lava flow, and then a lonely run back to the finish. I pass a couple of slowest runners of the 1/2 marathon, and try to encourage them (however, they are really tired). Crossing the finish line – photo curtesy of Petra Pirc. I finish in a little over 5 1/2 hours. Long after the good runners, but happy for the experience. I rambled into the finish line in a little over 5 1/2 hours. It is a nice marathon – not exactly a trail run, but much harder than a street run. The total elevation gain is about 3000 feet and the average elevation along the course is 8400′. However, it is the geology that makes this run so great. 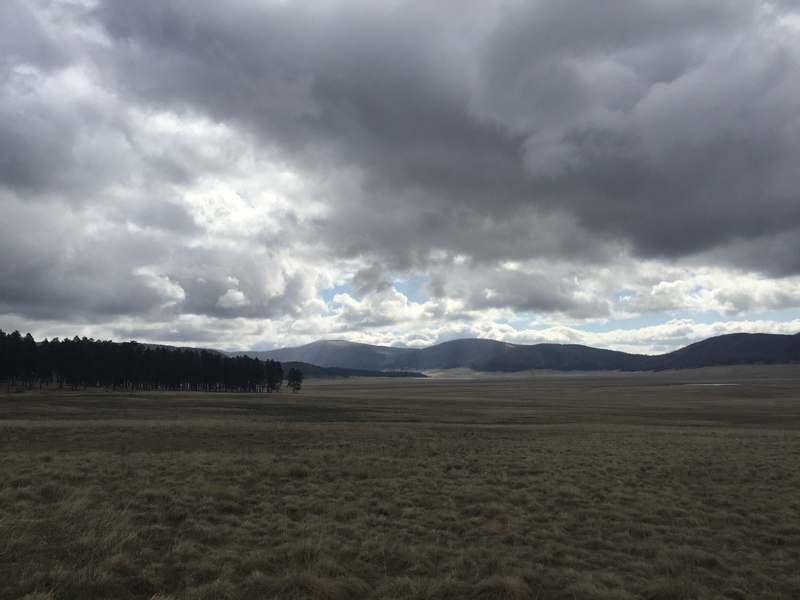 The Valles Caldera is truly a marvel…. 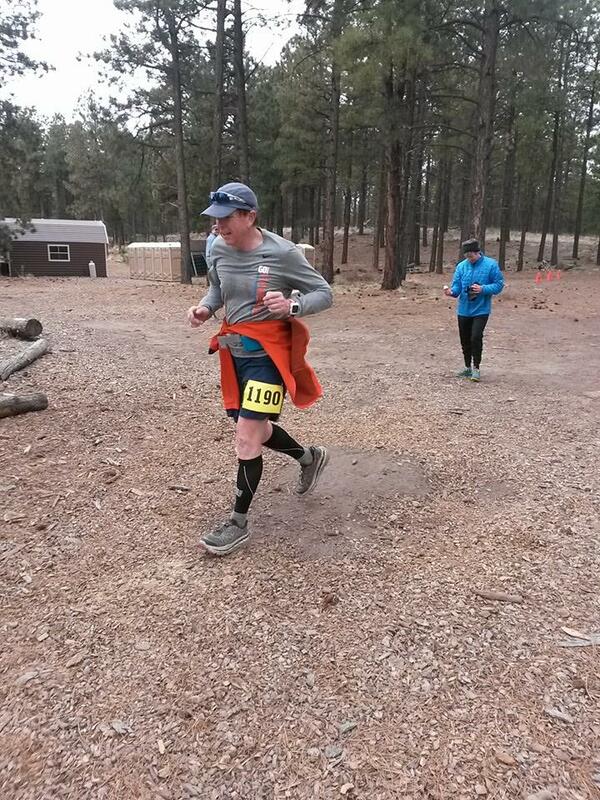 Posted on April 26, 2015 April 27, 2015 by wallaceterrycjr	This entry was posted in General Geology, Trail Running and tagged Jemez Mountain Trail Runs, Jemez Mountains, Trail Runs, Valles Caldera, Valles Caldera runs. Bookmark the permalink. One of my cousins taught in Bland during the 1929-1930 school year. I am searching for a picture of the school in Bland. Might you have one or direct me to someone who may? Thank you so much for your time.